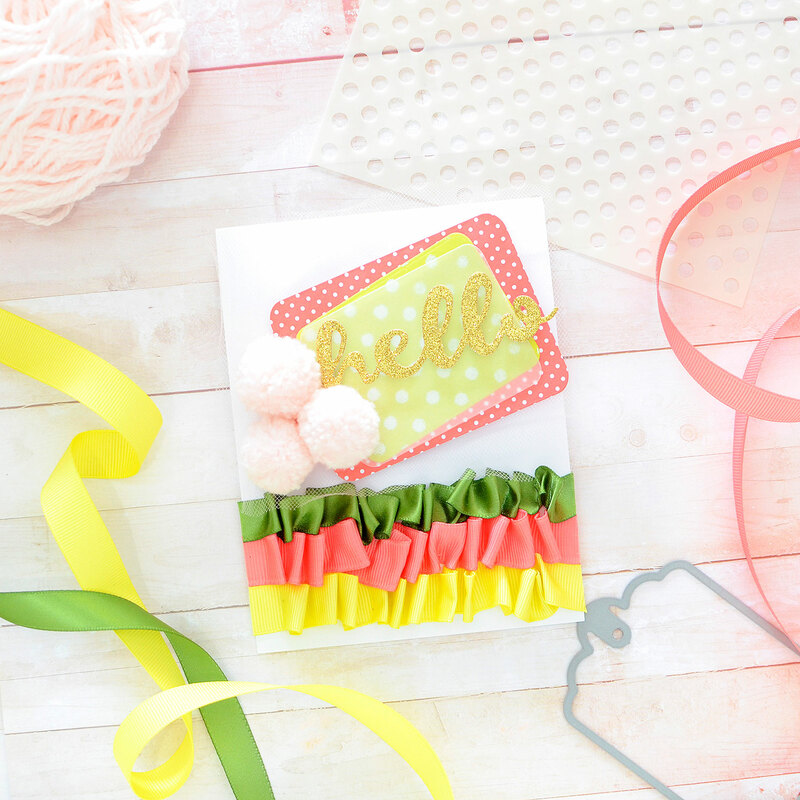 Papertrey Ink :: Transformation Tuesday :: Ribbons! Hello! I'm trying my hand at Papertrey Ink's Transformation Tuesday this week, which is one of my very favorite features. I'm always inspired to watch the other gals pick one of their past cards and transform it. It's fun to see how simple changes can produce a very different card! Most of my past work from the PTI blog has not really been cards! I started out on the Quick Stitch team, then moved to Moments Inked (planners), and then onto packaging (my favorite! ), but cards were actually the first thing I ever made when I started crafting and I still make them often, so I thought I'd give one of my old packages a card makeover today. 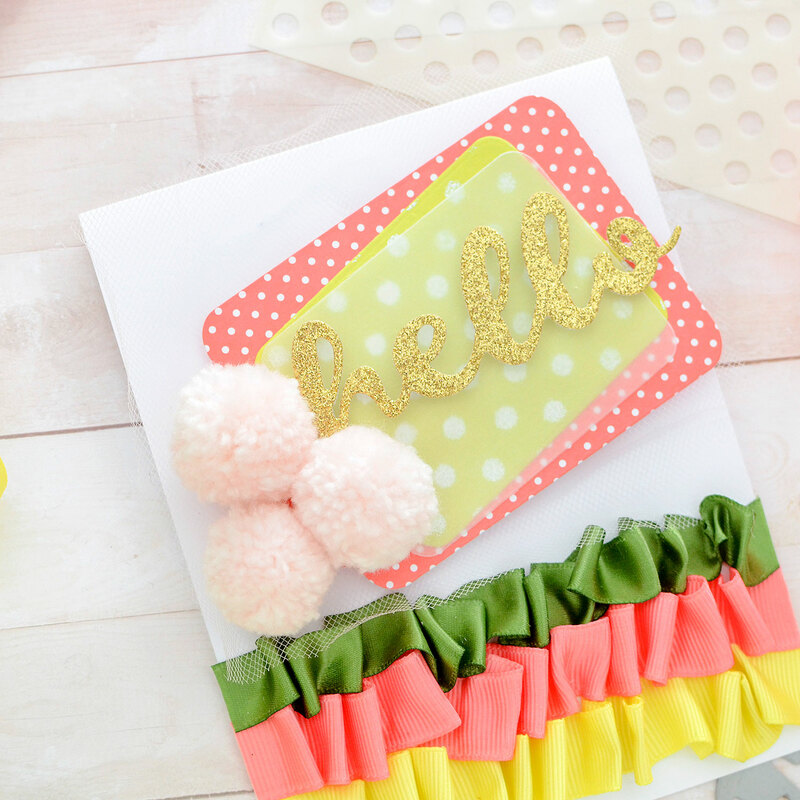 I always love the idea of using ribbons, fabrics, and other fibers on projects. 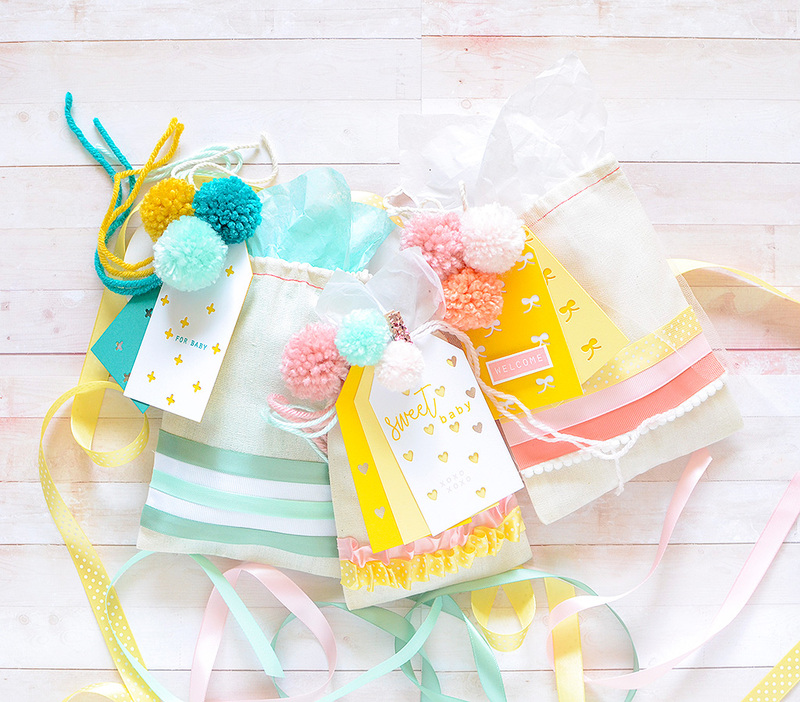 This original creation was a set of cotton gift bags, featuring ribbons and tags, but I decided that I could apply the same idea to a greeting card. I made some changes in color, tag style, and occasion, but still created a project full of colorful fibers! 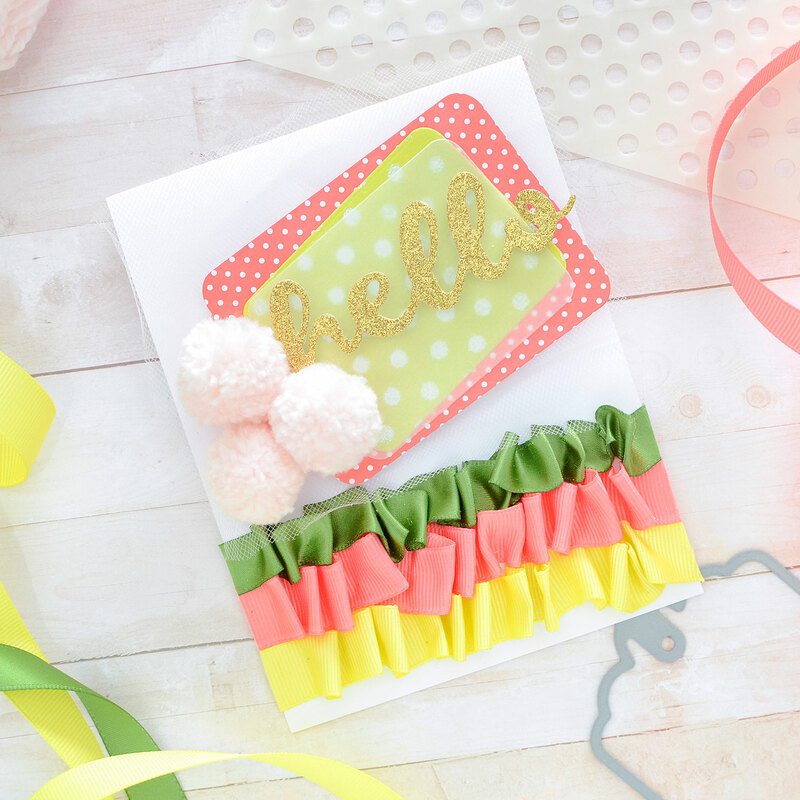 One of things I loved most about this packaging set was all the different ribbons, so I took an amalgamation of those styles and put them on the card. 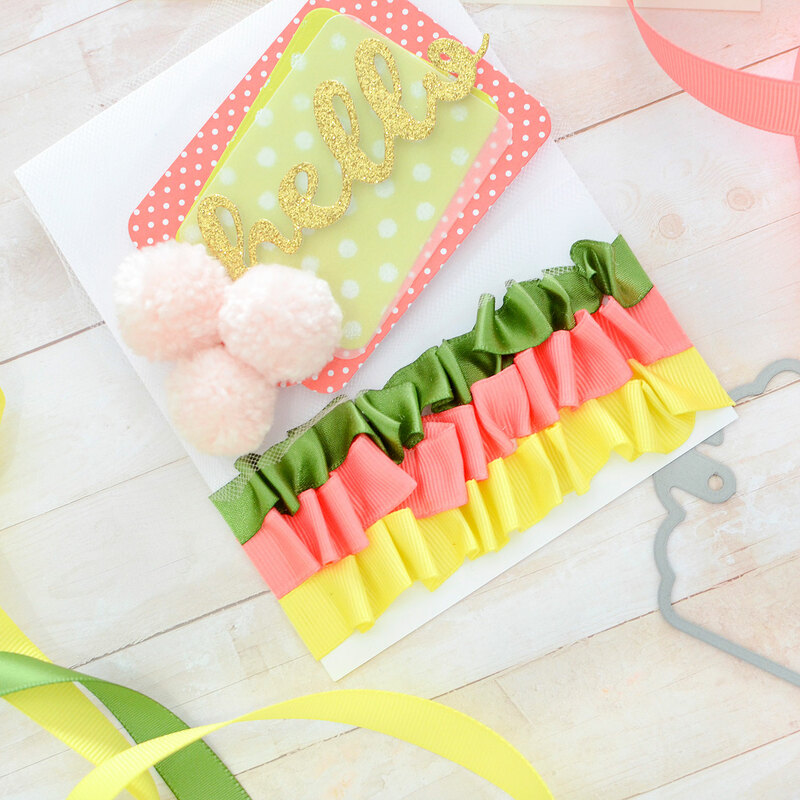 I recently got some new colors of PTI ribbon and when I was unpacking them, I happened to stack New Leaf, Berry Sorbet, and Limeade Ice together and LOVED them! I ruffled up the ribbons to give the card dimension, adhering them with fabric glue, but if you'd rather stitch them on, that's a fine option, as well. My card is A2 size (4 1/4" x 5 1/2") and the Pitter Patterns tags I used in the original project are 4" long, so I changed the tags and their orientation for this card, opting to use wider but shorter Scalloped Tag dies and making them horizontal instead of vertical. I cut the largest one from Bitty Big Berry Sorbet patterned paper and a smaller one from Limeade Ice cardstock. I used the Dots stencil collection with WaterMark ink and embossed white dots on it, then softened it up by laying a vellum tag over it. 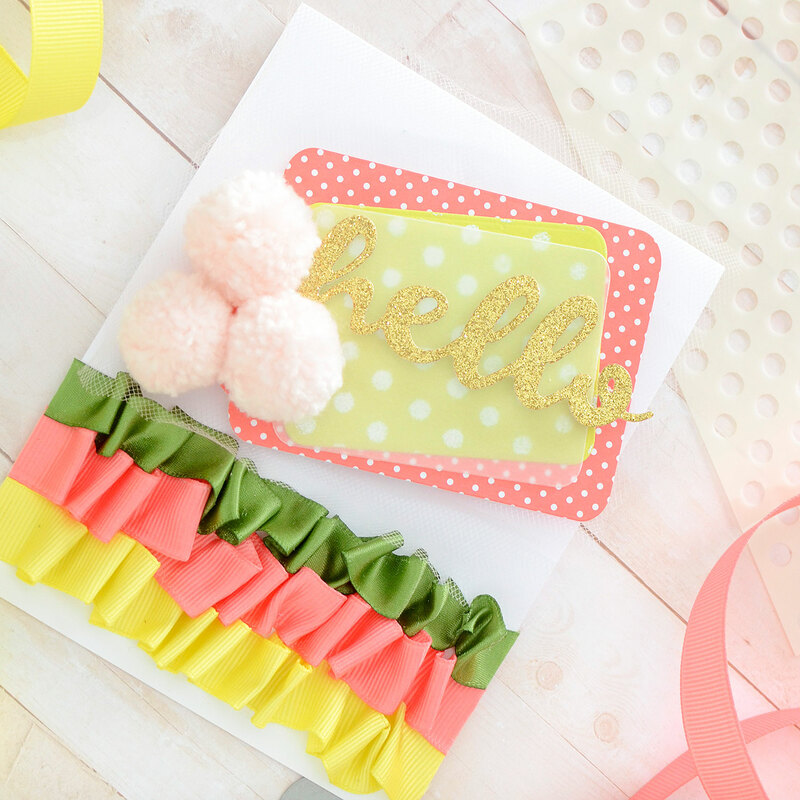 Finally, a shiny "Hello" is the new sentiment, perfect for any-occasion greetings, and because I can't resist the little pink pompoms on the gift bags, I made a few for this, too. Go big or go home, right?! Thank you so much for joining me today! It has been so fun to try my hand at these features and I hope you're enjoying them, too! Here is a step-by-step photo tutorial of the embroidery floss tassels, and again, I think it has links to the supplies. If I'm wrong, let me know and I'll look up where I've gotten things and the sizes for you. I hope this helps you! I still make these all the time and am so happy I can do it myself! Thank you for always leaving such sweet comments! They brighten my day!! Hugs!